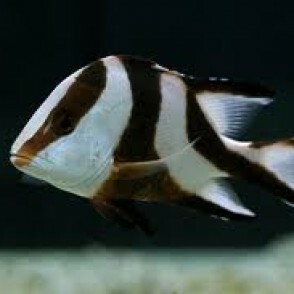 The Tank-Raised Emperor Red Snapper, also known as the Sebae Snapper, is vividly marked as a juvenile, with bold red to black stripes on a white body. 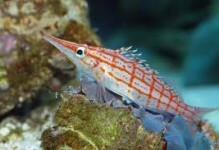 It is an extremely fast-growing fish, and with age, the striping begins to fade until the fish is an overall reddish-pink color. 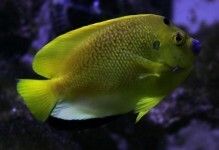 A 180-gallon or larger aquarium is necessary for this hardy and big fish. 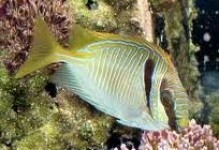 As a juvenile, it likes to school with other Emperor Snappers, but as an adult, it should be alone in the tank. 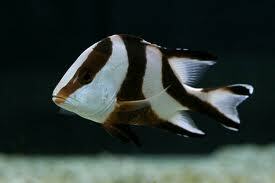 It may eat ornamental crustaceans in the aquarium. 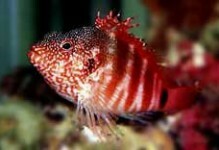 The Emperor Red Snapper should be fed once a day with its favorite meaty foods including chopped meats (scallop, shrimp, fish).